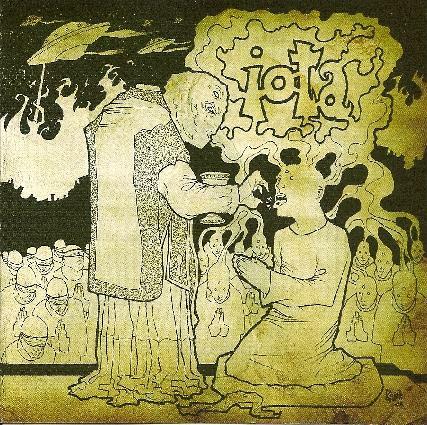 Salt Lake City's Iota have been unleashing their own brand of stoner rock on the world since 2002, but Tales is their first full length album. Pouring their stoner vibes into a huge metal pot, the band stir in psychedelia, space rock and even blues influences to create a heady sonic stew. The first two cuts, relatively brief, hint little at the storm to come, but are effective nonetheless. A New Mantis is the most typically metal track on the album, solidly written and tightly played. We Are the Yithians follows, with a more minimalist Hawkwind-like groove, heavy riffing punctuated with psychedelic guitar licks. The pace charges into overdrive for the 10-minute The Sleeping Heathen, with more epic riffing, but here the band veers away from its metallic tendencies into an extended jam of stoner sludge and heavy psychedelic madness. But it's the 23-minute long Dimensional Orbiter that is the real showpiece of the album, and certainly the touchstone for diehard space rock fans. Starting with a raging squall of guitar noise from lead axe man Joey Toscano, the rhythm section of Oz Yosri and Andy Patterson kicks in and the band just takes off. This time the riffing is more melodic, and dives headlong into a lengthy exploration of manic cosmic jamming dotted with expanses of spacey psychedelia. Toscano's guitar work is particularly exhilarating throughout. The album closes out with Opiate Blues, which is, as the title pretty much spells out, a heavy, druggy blues workout featuring some excellent harmonica playing from guest Bad Brad Wheeler. With Tales, Iota manage to put a fresh spin on the aging stoner rock scene, with some terrific vibes that will leave you begging for more.